A beautiful and functional timepiece, this watch makes star gazing an exercise in style, not astrophysics. 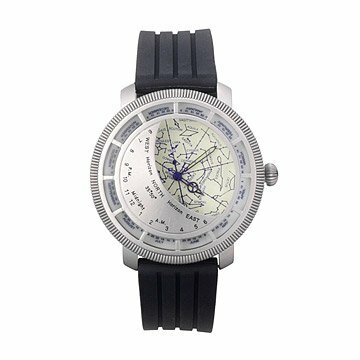 Chart your travels, trips and grocery runs with this exquisite Planisphere Watch, a time-telling chart that maps the night sky. Frequently used by the Ancient Greeks to navigate via stars and constellations, the Planisphere finds its roots in astronomy. Though with a Japanese-Quartz movement and glowing Swiss dial (glows for up to three hours), this modern wonder makes star spotting more an exercise in style, not astrophysics. Water resistant up to 3 ATM. Sport rubber band with steel accents. The Planisphere Watch is accurate in the northern hemisphere from 35 - 50 degrees latitude. The majority of the continental USA runs from 30-50 degrees latitude (with the exception of the southern tips of Texas and Florida). The bezel rotates to adjust the view for the date and time you are looking at the night sky. The watch came packaged nicely and looks very well made. I cannot wait to give it to my star obsessed girlfriend! The watch looks awesome! I'm sure my brother will be pleased. If not I will gladly keep it for myself ðŸ˜‚. The watch is awesome, perfectly good watch but with the added curiousity of seeing the stars and constilations how they were meant to be seen. This watch looks great. Very stylish and my husband has gotten lots of compliments on it. The problem is, the band is rubber and both bands which secure the strap have broken off. We've gone through two watches now. So maybe it's not good for an everyday watch. Awesome watch! The pictures online don't compare to the in person beauty this watch possesses. Received as a gift an very diffucult to understand an read .